Normal View mode is the default Timeline view mode, and will show everything that is connected to the chosen Display. While in this mode, anything not connected to the currently set Global Display will not be shown in the Timeline. This also means that you cannot add certain elements to view the Timeline, as by default, they are added unconnected to any Display. An example of such an element type is a peg. If you prefer to work as you did before, where you see everything in the Timeline whether it’s connected to a Display or not, you can change a preference to Always Display Unconnected Modules. You can find this preference in the Timeline tab—see Scene Setup Preferences. 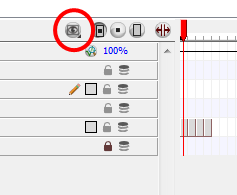 When working in Selection Only mode, only elements currently selected in either the Camera or Network view will be visible in the Timeline. This makes it easier to concentrate on one or a few elements at a time. The View Tagged Modules mode lets you see only elements which have been assigned a Tagged status. 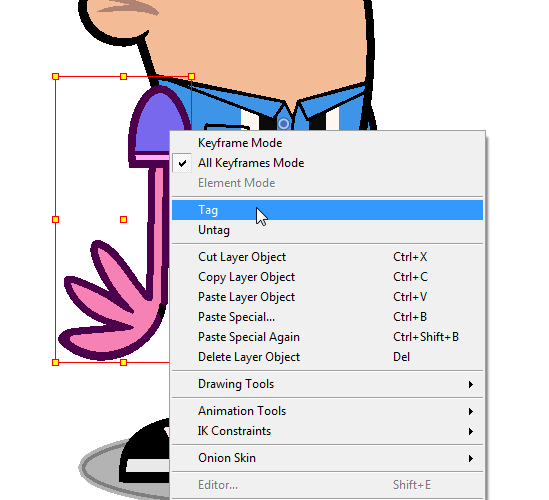 An item that has been tagged will appear in the Timeline with a small asterisks beside its name. 1. Click to select one, or multiple elements in the Camera view. 2. Right-click on your selection and select Tag or Untag. 1. Select one or several elements in the Network view. 1. Click on one or more elements in the Timeline view. Once your elements are tagged, and you have switched over to View Tagged Modules mode, the Timeline view will display only tagged elements. The red bar along the far left of the Timeline indicates you are in this view mode. While in View Tagged Modules mode, the asterisks will no longer be displayed beside the tagged elements.